Being a developer and manufacturer of electrostatic precipitators, OekoSolve is involved with relevant topics of wood energy and therefore deals in particular with the consequences of particulate matter pollution caused by wood burning and the maximum possible degree of separation for the reduction of regional and international particulate matter emissions. By integrating the fine dust filters based on the electrostatic principle, wood energy is resource-saving and environmentally friendly, but also ensures a healthy atmosphere. In comparison to fossil fuels, wood is CO2-neutral and resource-saving. But what does CO2-neutral mean? Wood needs solar energy and CO2 (carbon dioxide) for its growth. This energy is stored during growth, releasing the same amount of CO2 during combustion. 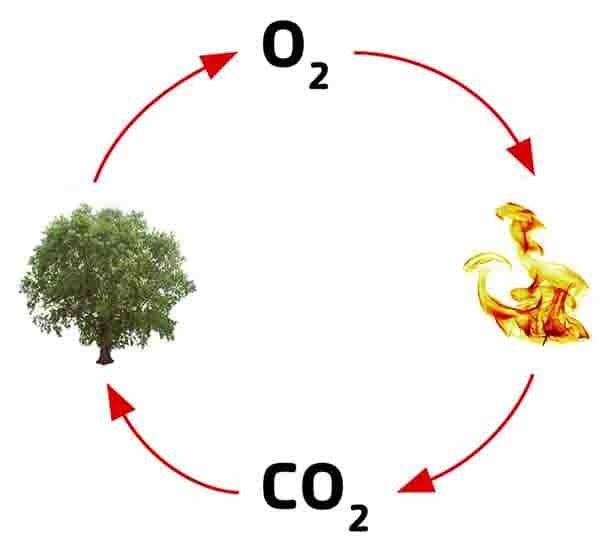 Unburned wood releases the same mass of CO2 during the degradation process. The new growing trees need the carbon dioxide as well, so that the natural cycle is preserved through the use of wood energy. • Equipped with electrostatic particulate filters: healthy.